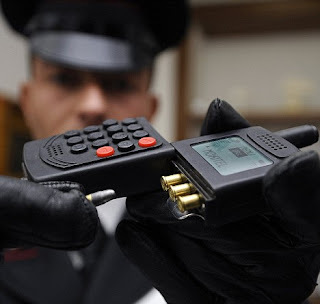 It's the mobile phone that could leave you with more than a warm ear. As startled Italian police discovered, the device seized in a raid on a Mafia gang is actually a pistol. 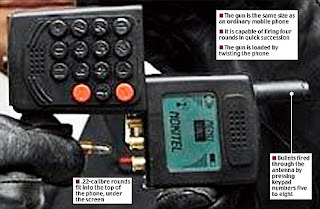 The phone gun - complete with a dummy display - holds four .22 bullets. It was fully loaded and ready to be used when it was found in Naples. 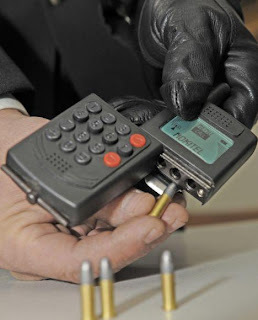 The phone transformed into a gun by sliding the keypad section. The stubby antenna is the barrel, and a touch on a particular key fires a bullet. A police spokesman said: 'This is the first time such a weapon has been seized and shows the sophistication that the crime syndicates are turning to. The raid in a Naples suburb was part of an operation against the Gionta crime family of the Camorra, the port city's version of the Mafia. Officers from the paramilitary Carabinieri police also seized two ordinary handguns, ammunition, bullet-proof vests, drugs and cash. A 28-year-old man was arrested during the raid in the Torre Annunziata area but several other suspected gang members escaped.